1.1 What Are Ratios? How Are They Used? answer the questions in this section. of miles each vehicle can travel using one gallon of gas. miles. How many miles per gallon does it get? 57 miles. How many miles per gallon does it get? 3) How many gallons of gas does the sports car require to travel 243 miles? b) The next activity illustrates how ratios are used to convert units . one balance pan and plastic chips in the center of the other pan. metal nut. Write the number of chips per nut as a ratio. 3) Without using the balance, calculate how many nuts there are per washer. Show the steps in your calculation , including units and how they cancel. d) Group Discussion Question: List some common ratios . Why are ratios useful? 1.2 How are Ratios Used to Calculate Efficiency? Your instructor will discuss ratios and the efficiency of energy processes. the crank of the first generator slowly 10 full revolutions. 1) How many revolutions did the crank of the second generator turn? generator crank is turned slowly. the efficiency when the first generator crank is turned rapidly. crank also turns 10 revolutions? Why or why not? energy per second required to light all of the bulbs in this demonstration? 1.3 How Do Exponents and Scientific Notation Simplify Calculations ? the base 2 raised to an exponential power. whose method is correct , answer the questions below. numbers with exponents, add the exponents. raised to an exponential power. exponents. Then check your rule by using it to answer the questions below. 4) State the rule for dividing numbers with exponents. When dividing numbers with exponents, subtract the exponents . raised to an exponential power. For example, in scientific notation 13,300 = 1.33 x 104.
energy as 1 kg of coal? energy as 1 kg of Uranium 235? 1.4 What is the Difference between Linear and Exponential Growth? Your instructor will discuss linear and exponential growth using the graph on the next page. in 2010? _5,000_ Add a data point to the graph to show the population in 2010. 2010? 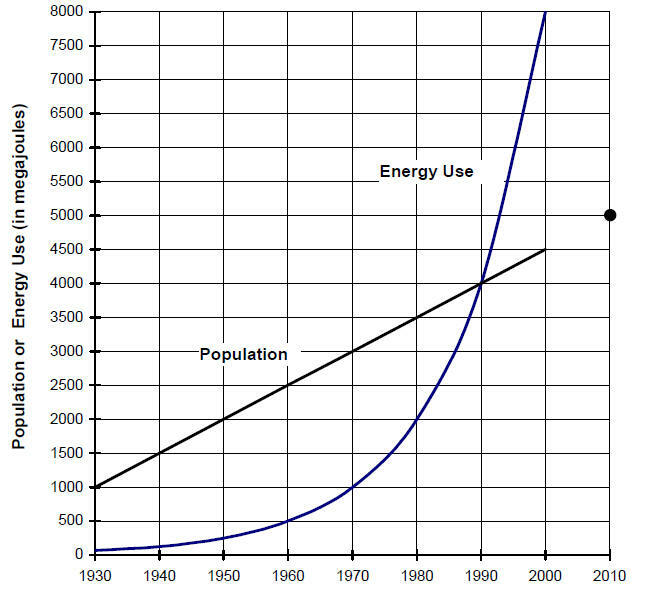 _16,000 MJ _ Where would a data point for energy use in 2010 be located? Above the top of the page.